The Bat Removal Pro Network: Find A Bat Removal Company Near You. LOOKING FOR A BAT REMOVAL EXPERT IN THE USA? YOU’VE COME TO THE RIGHT PLACE! Bat Removal Pro is a nationwide directory of Bat Removal Professionals and Wildlife Control Companies in the United States. Operators listed in our network are certified bat removal specialists. Not only that, but our site is loaded with useful info & guides about bat infestation problems. We do not work with companies who exterminate bats. Bat removal services must be completed without harming a single bat in the attic. We did not make this rule; the Federal Wildlife Authorities did, actually. Since bats are protected, a special process known as Live Bat Exclusion must take place in order to rid a bat colony from a building. However, if the bat was captured inside living quarters, that bat is eligible to be euthanized & turned into the Health Department for a rabies evaluation. After the bats in your attic have been excluded humanely, the attic may require some maintenance due to accumulated bat droppings. This step is important because the bats will have left behind piles of guano in your attic, which can pose major issues especially if a larger bat colony was involved. 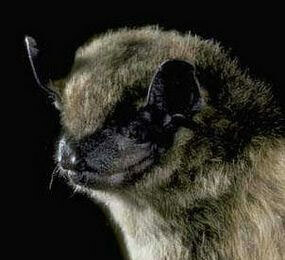 Bat guano also contains harmful bacteria which can cause respiratory infection and disease. We advise you to hire one of our pros for Bat Guano Cleanup, simply because it’s better to be safe than sorry. we’ve done our homework on every company for quality expectations & proper experience in handling bat removal projects. ALL our companies are certified bat control specialists. People who are experiencing bat problems in the home or attic should always educate themselves before hiring a company for the eradication process. Bat Removal is a specialty trade in the wildlife control industry, and not every company knows how to handle the problem professionally. You can rest assured that The Bat Removal Pro Network Of Professionals is a resource to find experienced providers who know the bat removal process like the back of their hand. Every company we list in our directory is certified in bat control, however, visit our blog to find out some important factors associated with getting rid of bats from your home or attic. About Companies In The Bat Removal Pro Network. The professionals listed in our directory will be able to explain the detailed process of bat removal upon the scheduled inspection of your home. Every house is different, posing new challenges and obstacles with it. Pricing of the bat job is dependent on the condition of your home. 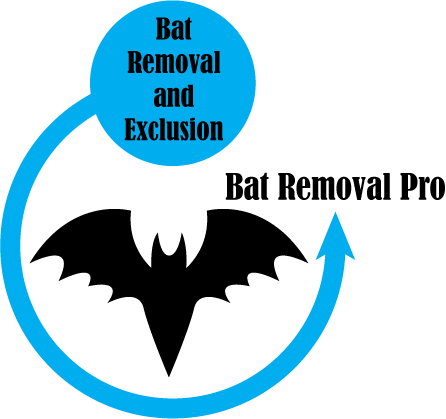 Experience in providing bat removal services is highly important because there are many things that can go wrong during bat exclusion. However, that is not a concern for the companies we list in our directory. We care about the bats. These are fascinating creatures that infest homes because of habit, not because they are trying to lighten your wallet. We work in conjunction with many bat conservation organizations in spreading awareness about the importance of saving & maintaining populations of bat species. One organization in particular we support are those at Bat World Sanctuary. These people rescue bats from all around the world, and we are passionate in sharing their ideals of preservation. 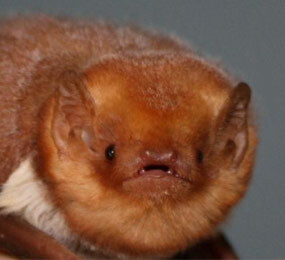 This medium-sized bat ranges from 10–13 cm (3.9–5.1 in) in body length, with an 28–33 cm (11–13 in) wingspan, and weighs between 14–16 g (0.49–0.56 oz). The fur is moderately long and shiny brown. The wing membranes, ears, feet, and face are dark brown to blackish in color. The Eastern small footed bat is between 65 and 95 millimeters in length, has a wingspan of 210 to 250 millimeters, and weighs between 4 and 8 grams. The bat got its name from its abnormally small hind feet, which are only 7 to 8 millimeters long. 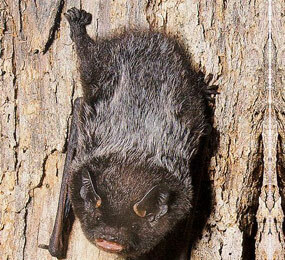 The fur on the dorsal side of their body is dark at the roots, and fades to a light brown at the tips, which gives the bats a signature shiny, yellow-brown appearance. The fur on the dorsal side of the body is a dull gray color, which is believed to help camouflage themselves in their hibernacula. The defining characteristic of this bat is its face-mask, which is completely black.They also have black ears, wings and interfemoral membrane, (the membrane between the legs and tail). As suggested by the bat’s name, its fur is uniformly dark brown and glossy on the back and upper parts with slightly paler, greyish fur underneath. Wing membranes are dark brown on a typical wingspan of 22–27 cm (8.7–10.6 in). Ears are small and black with a short, rounded tragus. Adult bats are typically 6–10 cm (2.4–3.9 in) long and weigh 5–14 grams (0.2–0.5 oz). Females tend to be larger than males. The fore and hind limbs have five metapodials. The skull of the brown bat lacks a sagittal crest. Its rostrum is shortened and has upslope profile of the forehead. Its braincase flattened and sub-circular when observed dorsally. The bat has 38 teeth all of which including molars are relatively sharp, as is typical for an insectivore, and canines are prominent to enable grasping hard-bodied insects in flight. The northern long-eared bat is a small bat, measuring an average of 8.6 cm (3.4 in) in total length, including a tail about 4 cm (1.6 in) long. Adults weigh between 5 and 8 g (0.18 and 0.28 oz). 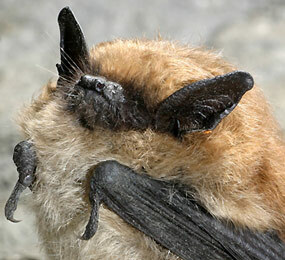 The fur and wing membranes are light brown in color, and the bat lacks the dark shoulder spots found in the closely related, and otherwise similar Keen’s myotis. Compared to other Myotis species, these bats have long ears with a relatively long tragus; when folded forwards the ears extend well past the nose. They also have a longer tail and larger wing area than most comparably sized Myotis bats, giving them increased maneuvrability during slow flight. This is a medium-sized Vespertilionid, averaging weights of 9.5–14 g and measurements of 112.3 mm in total length. Adults are usually dimorphic: males have red hair while females are chestnut-colored with whitish frosting on the tips of the fur. 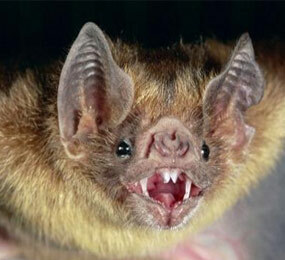 The hoary bat averages 13 to 14.5 cm (5.1 to 5.7 in) long with a 40 cm (15.5 in) wingspan and a weight of 26 g (0.92 oz). It is the largest bat normally found in Canada. Its coat is dense and dark brown, with white tips to the hairs that give the species its ‘hoary’ appearance for which it is named. The body is covered in fur except for the undersides of the wings. The bats can cover an impressive 39 kilometers while foraging. This medium-sized bat is predominately black (including the wings, ears, interfemoral membrane, and fur) with white-tipped hairs. The basal upper half of its tail membrane is densely furred. This gives the bat a frosted appearance and its common name’s sake. This species has a flattened skull with a broad rostrum. This species weighs around 8–12 g, has a total length of ~100 mm, a tail length of 40 mm, and a forearm length of 37–44 mm. 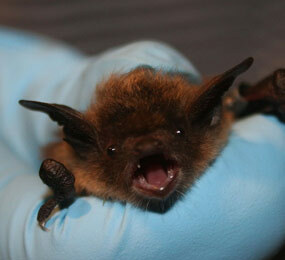 This reddish, yellowish and brownish bat is one of the smallest bats in eastern North America. The forearms are orange to red, and the wing membrane is black. Adults weigh between 4 and 10 g and reach a forearm length of 30 to 35 mm. They are easily distinguished from other similar species by their tricolored fur. These bats were renamed by Dr. Paul Cryan with the US Geological Survey. 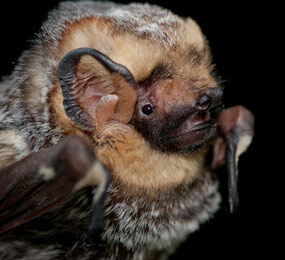 Here are some links to our States with high bat populations. 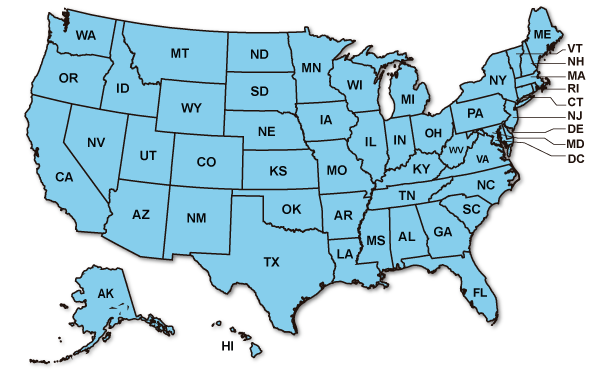 Visit our BRP USA Directory for more state bat links.